A popular theme of people living in the San Juans is a passion to conserve the whale population, specifically the Southern Residents. 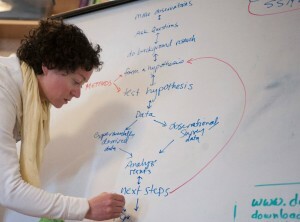 Beam Reach aims to give students a real world experience of what it is like to be a researcher or a graduate student. This is done by giving them tools and information to pick a topic and research it in a sustainable way. 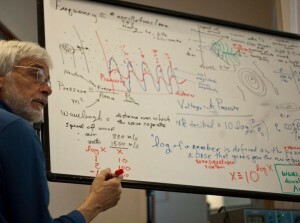 It also aims to have students think about how to present their findings both in papers, presentations, and now video. 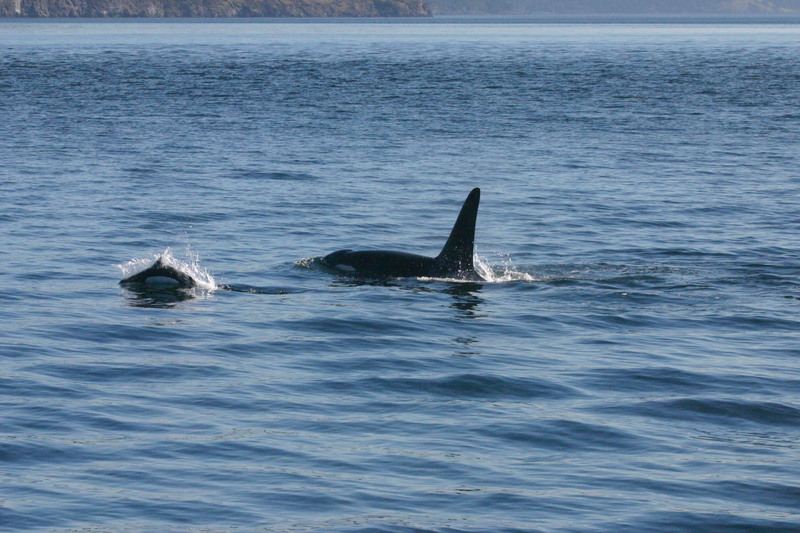 We will use sailing and an electric motor to travel through the Salish Sea gathering data on killer whale behavior and their calls with the use of hydrophones. This opens up a wide realm of questions to be asked by students for their personal research topics. A full week has gone by in my adventure with Beam Reach. By full, I mean a whole week and a very busy one. 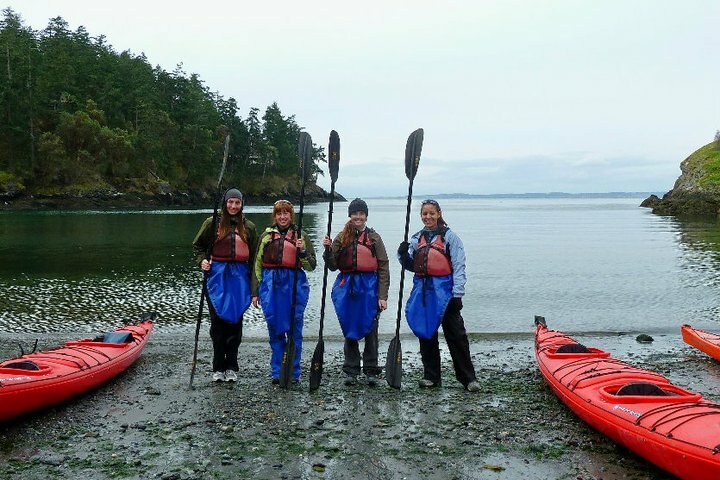 We first explored San Juan Island by visiting Lime Kiln State Park. It just so happened that transients were in the area. Luckily, Kelsey spotted them from a window in the lighthouse. Talk about the stars being aligned. 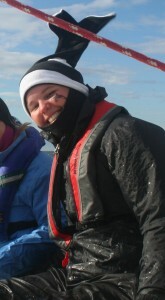 (You can check out this blog by an avid whale watcher, Jeanne, who was able to track down the whales we saw. Of course, that means her pictures are much better than ours.) Hopefully, this trend continues in the coming months. We have also gone out on a hike, a kayak trip, and a visit to The Whale Museum. Our brains were also very active throughout the week. 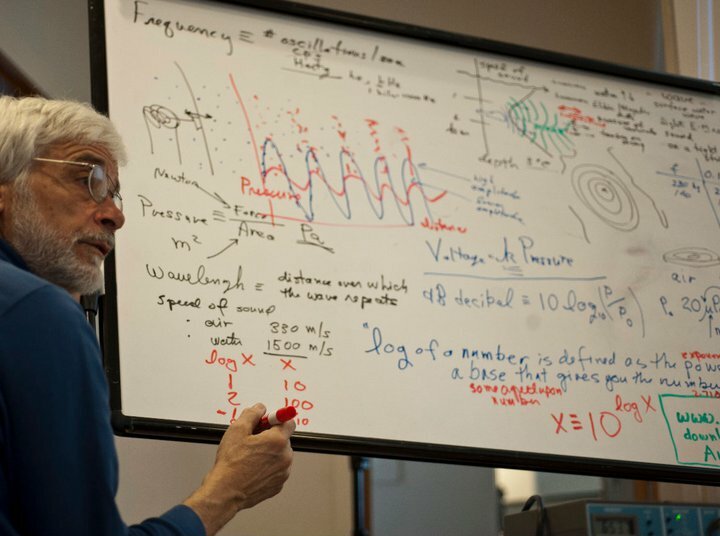 We have explored many topics from Bathymetry to Bioacoustics through lectures given to us by friends of Beam Reach in the field. As you may have guessed, a slide presentation was usually displayed. If you have ever used PowerPoint, you know that it is difficult to zoom in without distorting the image. During his lecture on the Environment of the Salish Sea, Scott used Prezi to create his presentation. Prezi is a free way to make a presentation online that gives you the ability to zoom in! It also allows you to visually map your ideas to better show how they relate. I was experimenting and made my very own Prezi. You can check it out here. I attempted to point out some neat features unique to this newly discovered tool. The path through the Prezi is also representative of how all of us feel after the first week. It has been a little overwhelming with all the newly acquired information, but it is beginning to come together for us all. I had a lot of fun making it, and I will definitely use Prezi in the future. I hope that it will help you make more powerful presentations in your future as well. Go to http://prezi.com/ to get started on your own Prezi. I will leave you with some food for thought. Here are the preserved brains of a Spotted Dolphin, Human, and a Fin Whale that are displayed in The Whale Museum. It is interesting to see that the brain size in these mammals are so similar. Special thanks to all of our teachers throughout the week! First week in the San Juans! 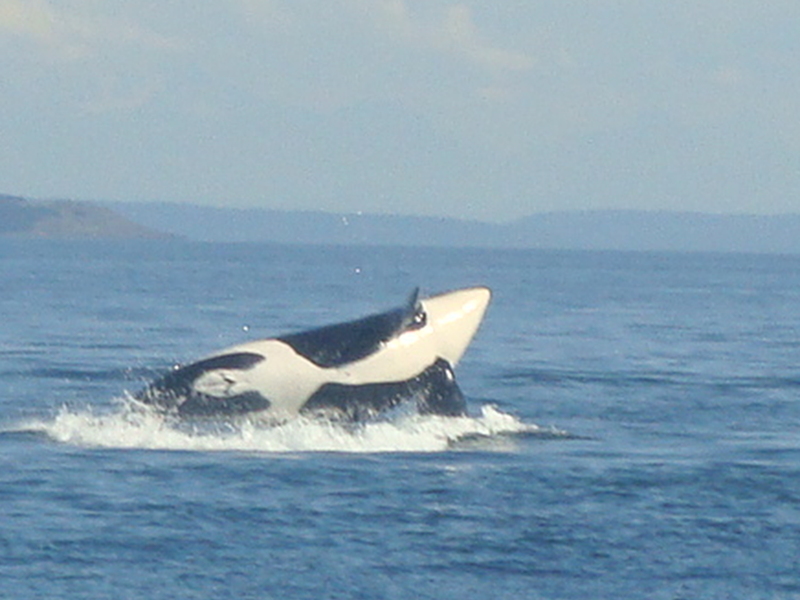 After being here for only a week it is apparent that the San Juan Islands are a tight knit community full of passionate people dedicating their lives to these killer whales. They don’t only refer to individuals within pods as J1 or K8 but have chosen names such as Capuccino, Blackberry, and Doublestuf that allow any individual to feel more connected to the whales. What I am most fascinated by is the Indian art that floods the island. This art seems to illustrate the underlying history of the mystery behind these whales. At our instructor Val Veirs’ house there was one peice of Indian art that particularly caught my eye. 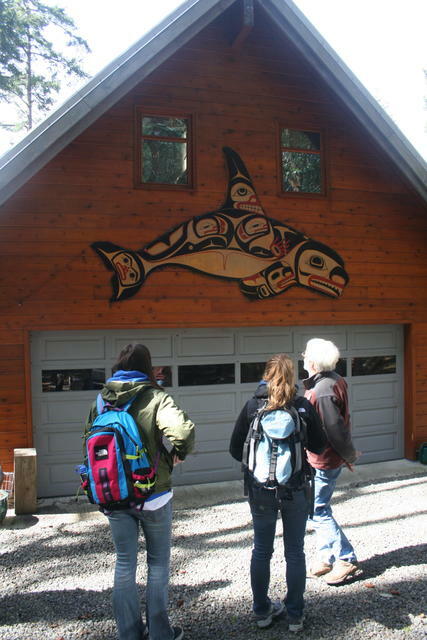 It was a huge wood carving of a killer whale overlain with a beautiful painting. I’ve been intrigued by native designs and woodwork especially of salmon and killer whales since I was little, so naturally I was curious to know the story behind it.This Tlingit story focuses on the boy in the dorsal fin of the painting and how he endures an adventure that eventually leads him to seek revenge on his two brothers in law. The boy does this by creating the killer whale from a wood carving and bringing the whale to life by throwing it in the water. Once the killer whale kills his two brothers in law in revenge, the whale asks if there is anything else he can do for the boy. The boy asks for one more favor. He asks the whale to never harm a human being ever again. This establishment represents the peaceful relationship between humans and these killer whales. People in the past have referred to these whales as “Devils of the Sea” but there has actually never been an instance where a killer whale in the wild has ever harmed a human being. The artist responsible for this artwork is named Odin Lonning. You can check out his beautiful artwork at http://www.odinlonning.com/. Overall this trip has been quite the adventure so far but there are many more to come! In the next few blogs I will mention my classmates more often so you get to know them as well! The picture below is of us four girls about to go sea kayaking. In order from left to right is Ally, Mandy, me then Emalie. Updates will be available in the next few weeks! Dave Cade recently finished editing a great highlight video with footage he, his classmates, and Beam Reach staff acquired last fall while studying endangered southern resident killer whales and their environment. We hope you enjoy the new footage! He even mixed some underwater recordings into the musical sound track. 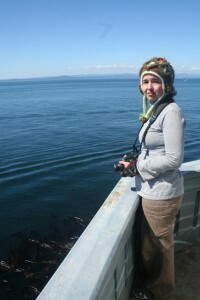 Martha Baskin of Green Acre Radio (on KBCS) put together a story about “Orcafest 2010,” an event welcoming the southern resident killer whales back to Puget Sound this winter, organized by The Whale Trail and Killer Whale Tales. 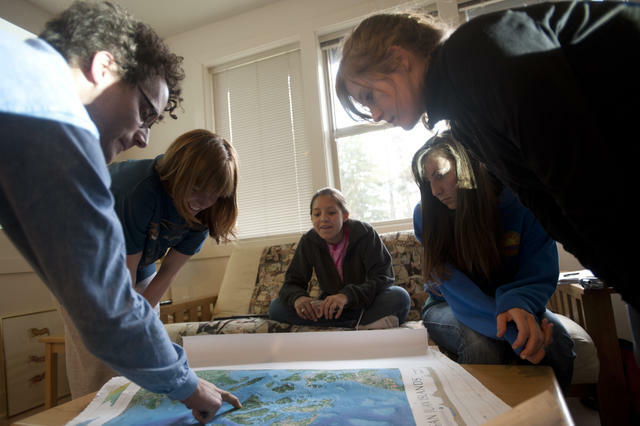 The piece features music and explanations from Duwamish tribal members, and quotes about the orcas from Donna Sandstrom, Darcie Larson, Scott Veirs, and Brad Hanson. During our great and enlightening journal club discussions, in which each student leads the discussion on one of the seminal articles for their own project, we learned some new categories used to estimate the extent of the social role that a given individual can exert over a group. One of this categories is known as “betweenness” and it measures how often a given individual is found in between clusters. 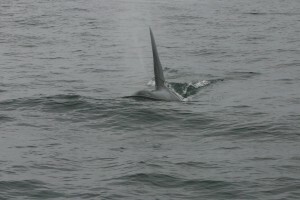 An individual with a high level of “betweenness” is then expected to be an “information broker” in cetacean societies. Another related category is known as “degree.” The degree of an individual is the measurement of its influence on its peers. The betweenness and degree levels of our SRKWs has never been fully studied. 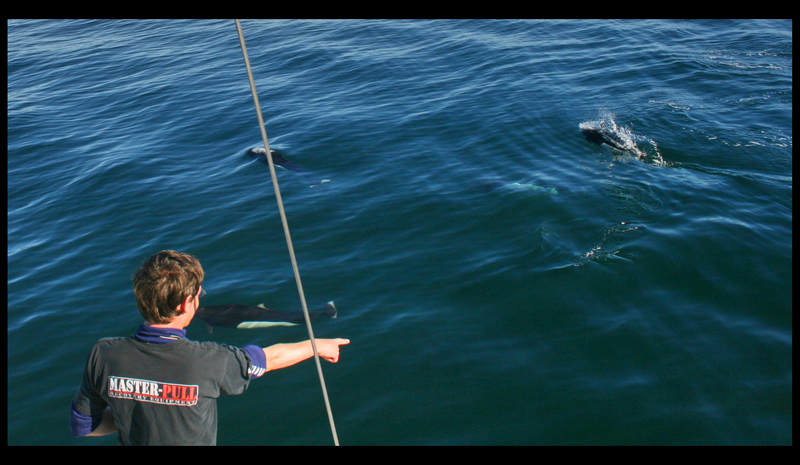 However, during our research we were lucky enough to catch some of these interactions. 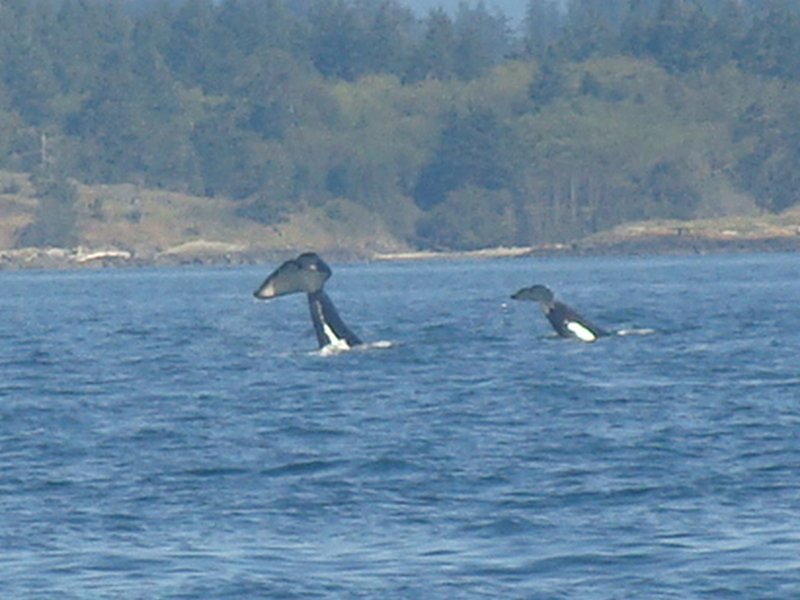 Our photographic record revealed some of these events, in which matrilines across pods mixed with each other or individual whales joined different matrilines. 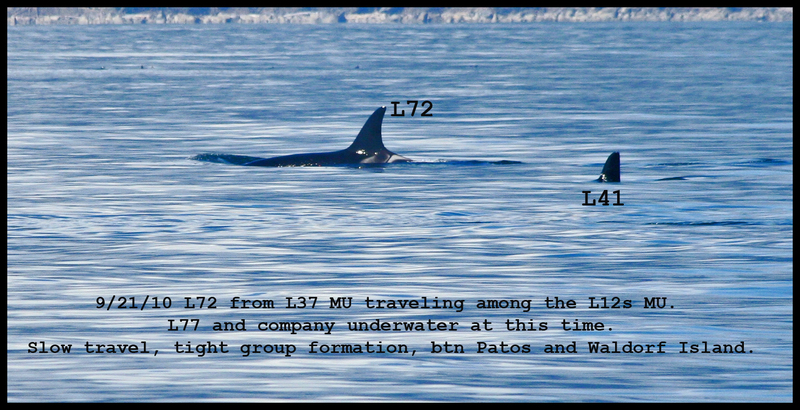 Some of the biggest “wonderers” observed during our 5 weeks at sea were J27 (male), J1 (male), K21 (male), L 77 (female), L72 (female). 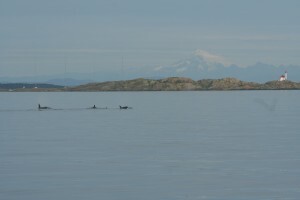 Flat, mirror like waters were suddenly broken by the splash of Dall’s porpoises swimming around a large male killer whale. These creatures seem to have the adrenaline-addiction gene. 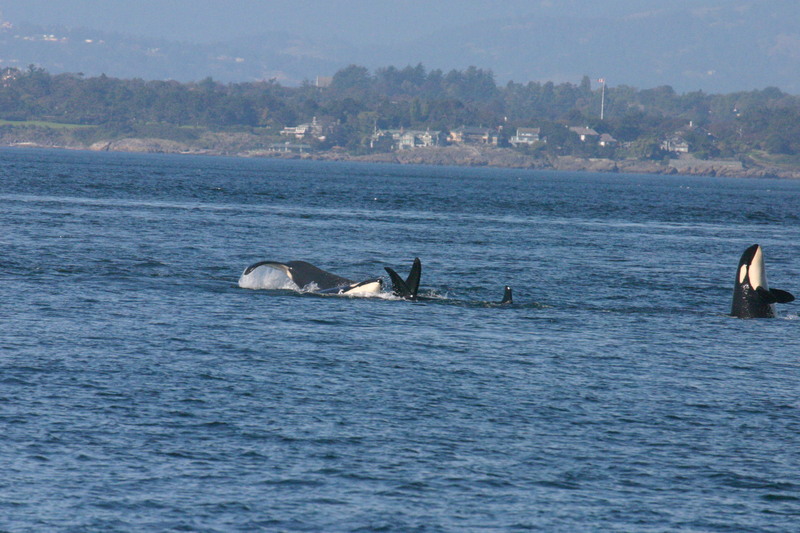 Riding the bow wave of an orca is not exactly the best idea for a cetacean one seventh of their size. Although our resident whales are fish eaters, there have been accounts of instances in which southern residents have killed Dall’s porpoises while at play. 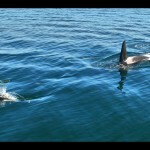 Whether a challenge or a game, the Dall’s seemed the most interested in the interaction as the killer whale seemed to zig-zag her path trying to shake them off. 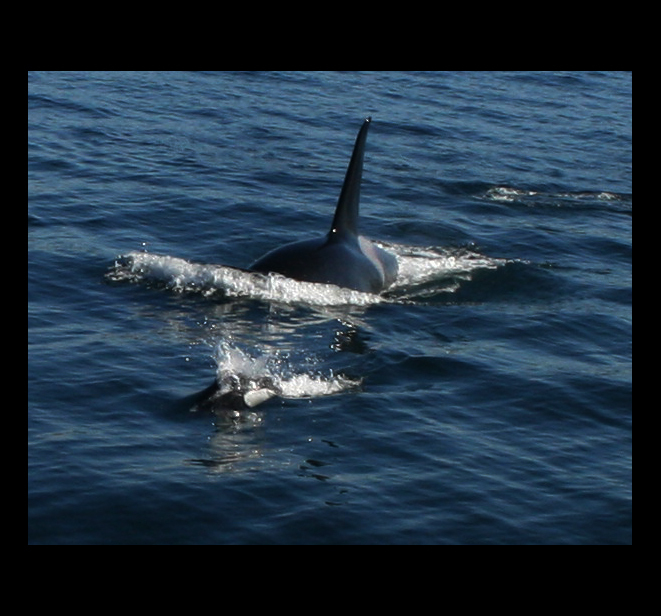 Whatever the reasons behind this dangerous game, to us humans it was like seeing a mini-orca and a full sized one side to side, sizing each other up, comparing dorsals, comparing speed…or perhaps simply having a profound inter-species recognition. Dall’s have never been preyed upon by southern resident killer whales, so it is conceivable that the few deaths reported from “play-like” interactions were just unfortunate consequences from the orca’s inability to measure its own strength against their much smaller “play-mate”. 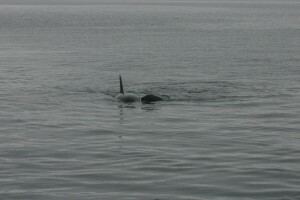 The short, playfull and peaceful interaction we were able to witness was certainly awe inspiring. A day in the life of a Beam Reach student! It’ s time to choose your own adventure with Beam Reach. Decide what to eat for breakfast, contemplate your research priorities, attend to the ship’s systems, and — maybe just maybe — get a chance to study wild killer whales. Just click here or on a photo below to navigate through a day-long experience as one of the six Beam Beach students. I know, I have already given my top marine mammal moments, but after some discussion I was granted permission to give more details about one of my favorite encounters, and one that I didn’t even mention in my earlier blog because I was unsure about posting it. I briefly mentioned our encounter with K21, Cappuccino, making the S10 call by our hydrophone before, but here I will give you a few more details. 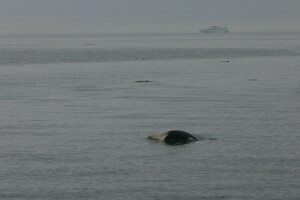 We had been following the whales from East Point, and had almost reached Turn Point. We had been having trouble all day keeping up with the whales because we can only go 2.5 knots through the water so we don’t get very much flow noise on our hydrophones while recording, so we were hanging out with the stragglers of the group which happened to be K21. He was on our port side for quite awhile at about 9 o’clock, when he very abruptly turned 90o towards us. Look closely, you can see him underwater! As he got closer Todd killed the engine and he sure made a B-line for us. 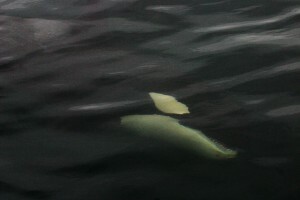 He swam right up to our stern, where our first hydrophone was at the time, stopped, made a vocalization, and went on his way. I like to think he was telling us hello or actually trying to communicate with us since his call was so directed to the hydrophone. 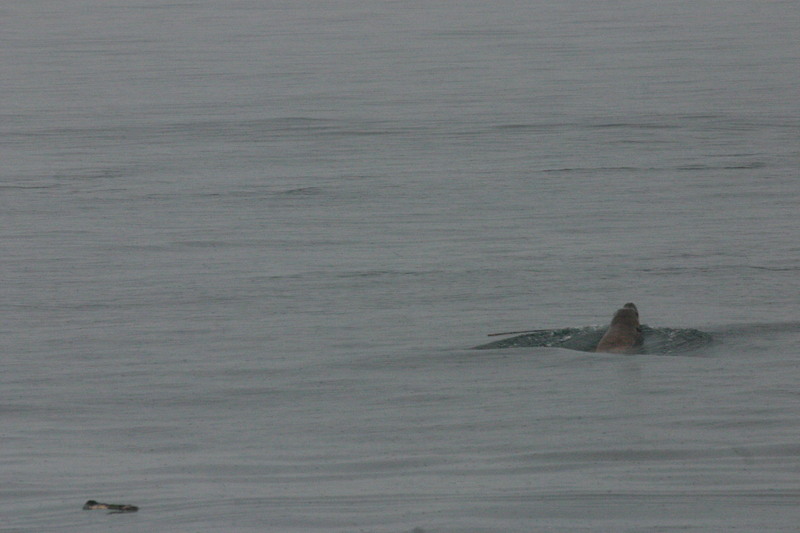 He was so close that we could see him swimming underwater! Since he was so close and gave a call at the right moment we got an awesome recording of it. His call is classified as an S10 call, but he combined two of them to make an extra long call. It came out so beautifully on the spectrogram because he was so close, the background noise couldn’t really be detected. Finally, I have saved the best for last. 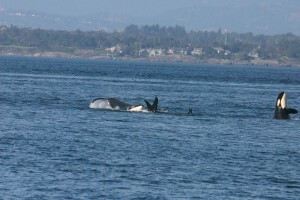 This special encounter happened on our most bio-diverse day and is still the most vivid memory I have with the whales. There we were aboard the Gato Verde collecting some great data for our research projects, most of the afternoon we had been with members of J-pod. 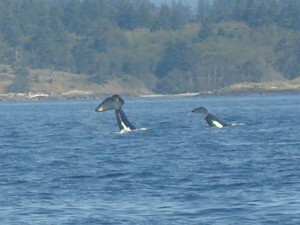 Of course we thought just being around the whales was cool in itself, which it is, but we were in for a special treat. J28, Polaris. and her calf J46, Star, had been trailing us for a while, but they were getting some speed and catching up to us on our starboard side. They were probably about 100-150 meters away milling around, and we were all stood on the deck just staring at them. 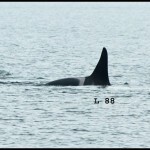 J46 did a couple tail slaps and gave Mama some kisses, it was just too cute. All of a sudden they both directed their travel towards us, Todd killed the engine and we all observed with excitement. 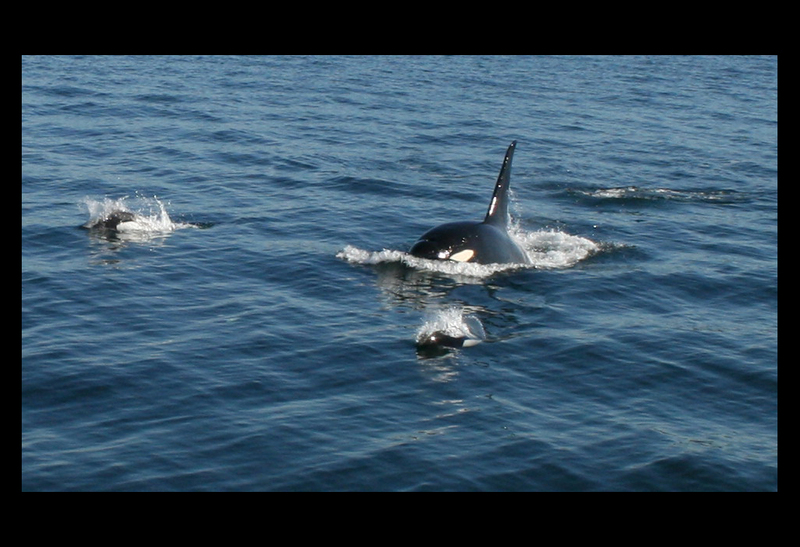 As they approached the boat together, J46 sped up and pulled away from his mama as if she was curious about us. 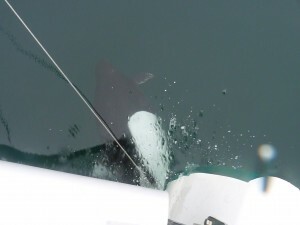 I was standing right on the edge staring into the water as J46 came up to us, turned over on her side, basically gave the boat a hug with her peck fins, and opened her mouth as if she was smiling at us. I even made eye contact with her! As weird as it may sound, I felt like we made a connection of some kind during that moment. We were also able to see his teeth when he smiled at us. I mean, she was RIGHT THERE! YOU CAN SEE THE TEETH!! 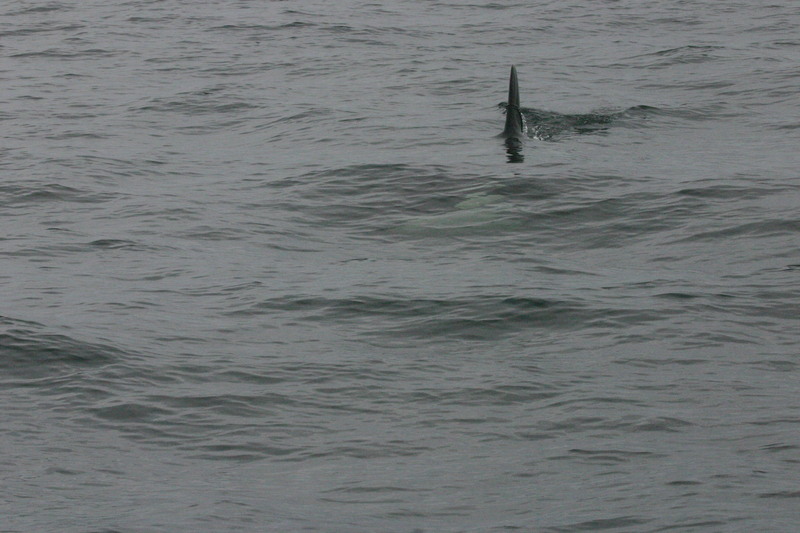 J28 followed behind her, and they both swam off behind us. All this happened in about a matter of two to three minutes, and it all seemed so unreal! 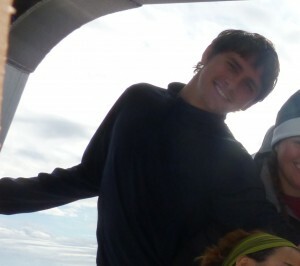 Everyone on the boat was so excited, even Todd said that had never happened to him before. Just to clarify, during all of our time with the whales we follow the Washington State Law and the Be Whale Wise guidelines, but sometimes the whales can surprise us by being curious. In support of a collaborative study of how fish use the San Juan Archipelago (headed by the University of Washington and funded through the Salmon Recovery Board), the fall Beam Reach students deployed a new fish tag receiver at the mouth of False Bay. The wind and wave conditions were worsening, ultimately reaching 30 knots and 4′ waves in Haro Strait, but we managed to launch the dinghy safely in the lee of the point that bounds the southern side of the Bay. Waves were moderate enough (1-2′) at mouth of False Bay that we were able to deploy a 2nd Vemco VR2 receiver (SN 101006) with the dinghy. Waves were too rough to get ashore to secure a tether, so we deployed two pier blocks connected with ~100′ of crab pot line about 20m WSW of the highest point on the islet. The inshore block is in about 4-6′ of water and was deployed at 11:29 at 48 28.785, 123 04.406 (WP 265) after being tied via the galvanized ring to the 100′ connector with a rewoven figure-8 knot with a double stopper safety. Garrett thought the inshore block may have been in a depression between the main islet and a subtidal boulder. The connector line was deployed more or less linearly through the abundant kelp and then tied to the bottom loop of the offshore block. The offshore block and mooring was lowered with a slip line (attached to the uppermost loop, above crab pot float) in ~25′ of water at 11:37 at 48 28.774, 123 04.417 (WP 266), still well within the kelp forest. 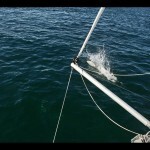 Water depth was measured by halving the total slip line length (30′) and adding it to the mooring height (~3m). Mooring details can be ascertained from the photos, but the spacing between block and receiver was about 1.5m and the space between the receiver and the float was about 1m. Both blocks were fixed with crab pot line run through hole with double figure-8 knots, each secured with a double stopper knot. We will have to return at a lower tide and in calmer conditions to again search for the shore tether used in the previous deployment. With luck, a snorkel or short SCUBA dive will lead to the recovery of the previously deployed receiver (SN 100910 at 48 28.748, 123 04.411). There isn’t much hope, however, for using a grapnel in that kelp forest! Being on a boat for over a month really gives you some eye opening experiences with amazing creatures. I’ve seen more marine mammals in the past 5 weeks than I have in my entire life! I’ve loved marine mammals most of my life and never thought I would get to experience all this in such a short time. So I have picked out the top moments to share with you. The second morning on the boat we were in Snug Harbor on the west side of San Juan Island, we had been getting texts throughout breakfast that the whales were at Lime Kiln, the Orca Sound. What we didn’t realize is that those are just south of Snug. We started getting everything ready to go and kept an eye out for some whales (it was really foggy that day) as we headed out. Just as we came out of the harbor someone shouted “WHALES!” and the frenzy began to put hydrophones in to start our data collection, which we weren’t really sure how to do, all while trying to watch the whales because we were all so excited. 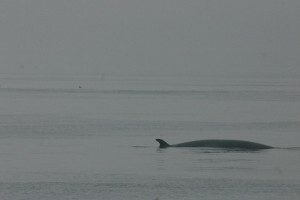 During the day we got to follow them for a couple hours, and we had them to ourselves, but lost them in the fog. This was my first Southern Resident experience, and we were lucky enough to have them literally at our front door in the morning, I don’t think I have ever been that excited, but it was only the first of many experiences to come! Okay, so this day has to be the best marine mammal day I have ever experienced and the most diverse, species wise. 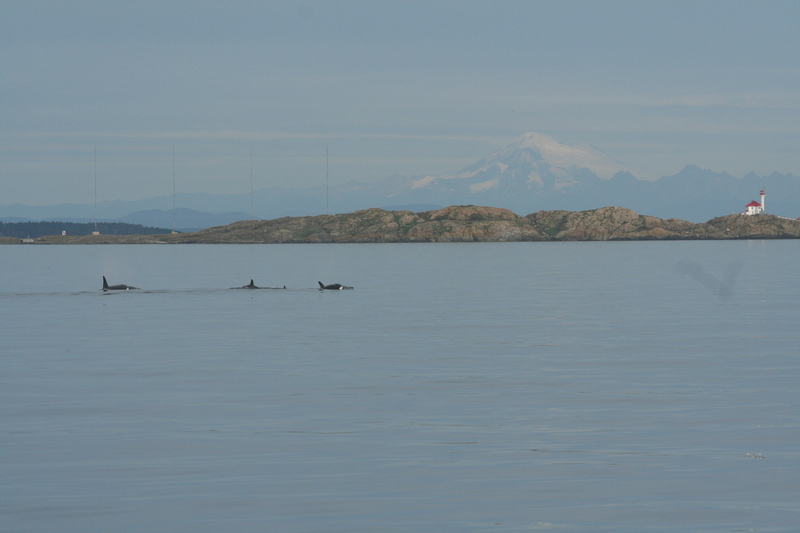 We spent the night at anchor on Lopez Island so as we started heading North in hopes of catching up with whales, we came across a Minke whale!! 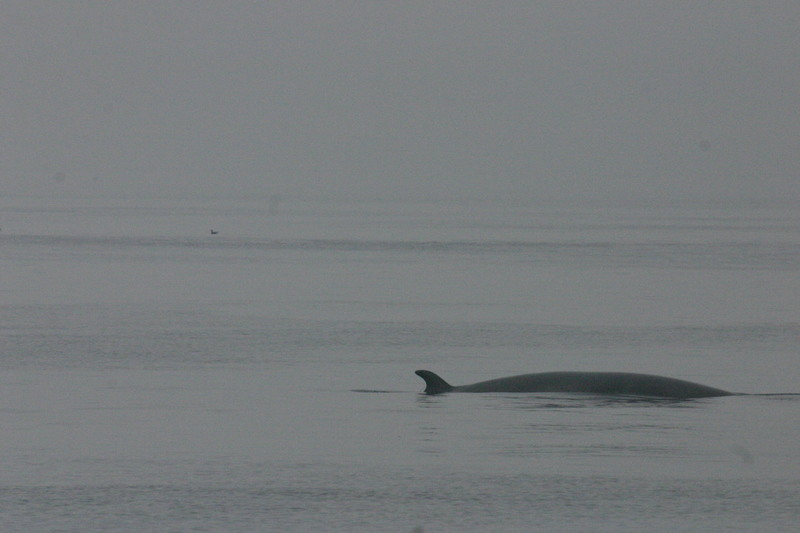 This was my first Minke whale experience, so that in itself was awesome. 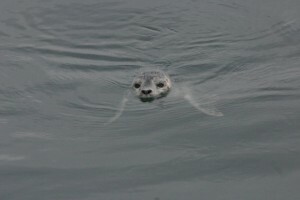 Just as the Minke whale was escaping us a Harbor seal pup was swimming around the boat. 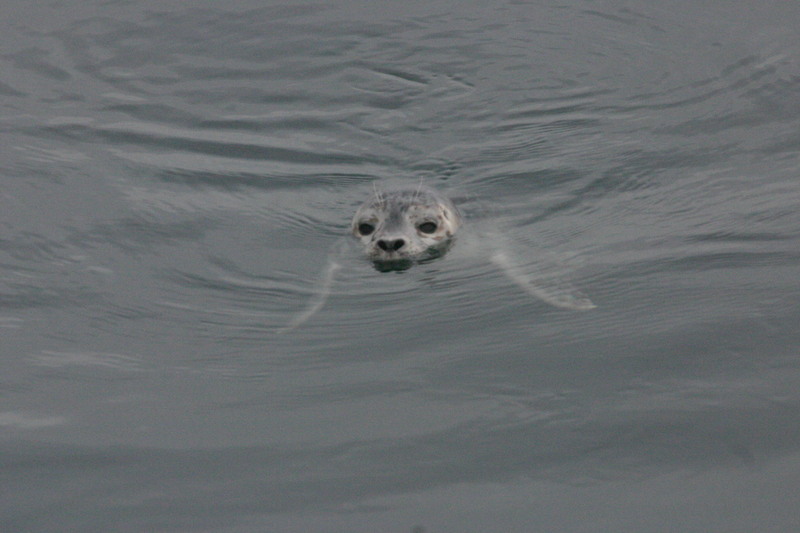 Even though we had seen Harbor seals before, this one was a baby, and you could see it swimming underwater! It swam around our stern for a bit, then under the boat to the bow and back around to the stern where it approached our stairs and looked like it wanted to jump aboard and join us. You could see its little fins trying to hard but he was unable to make it up. I guess this was for the better, but it was just so cute. 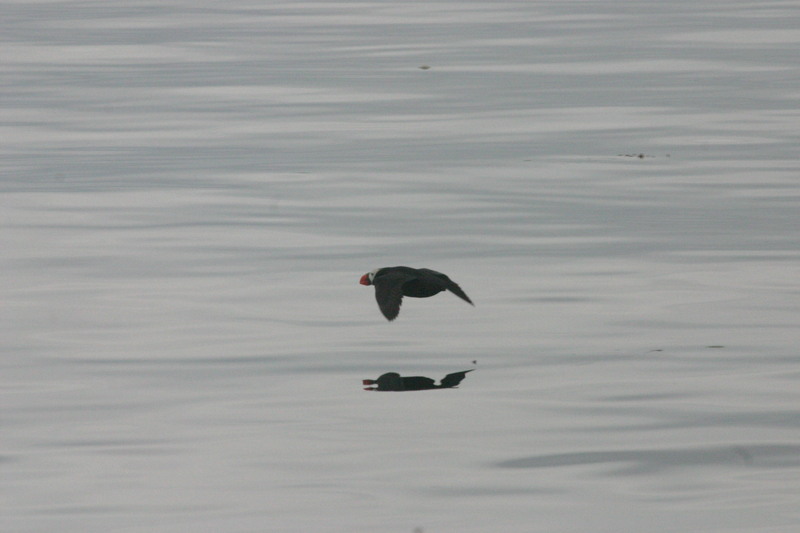 Oh, and amongst all of this Val was able to get a shot of a puffin! 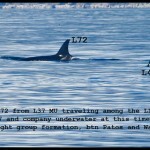 Not a marine mammal, but awesome nonetheless since they are so rare around this area. After all that excitement, we figured we had already had a great day, but that’s not all that was in store for us. 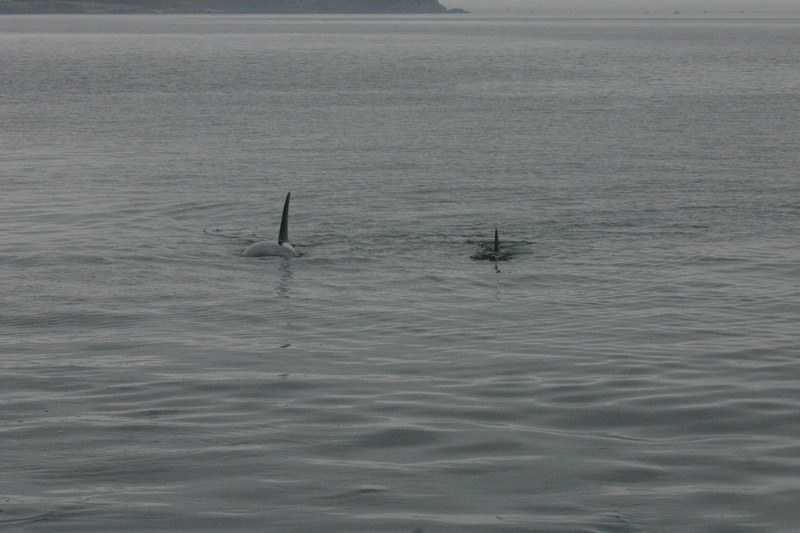 We later came across Orcas! This was our 3rd day in a row with them, but the excitement had not worn off. We got great recordings, and saw some amazing behaviors! 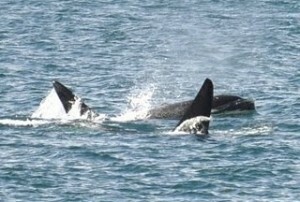 This was definitely the best orca day yet. 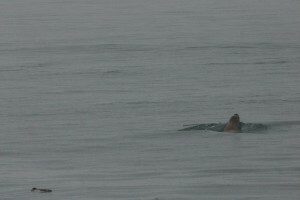 As we were recording, we saw a Stellar sea lion!! 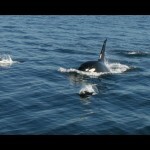 He was lucky those were Southern Resident killer whales around, and not Transients. We were moving away from him so we didn’t get much time with him. On our way to our final destination we came across both Harbor Porpoises and Dall’s Porpoises at about the same time, and some were bow riding the boat nearest to us. 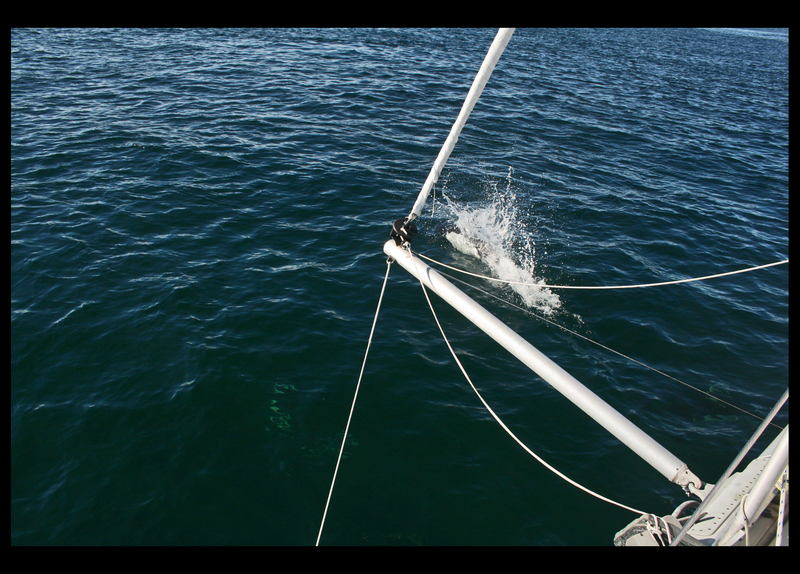 On our voyage back to Friday Harbor Labs for re-provisioning some Dall’s porpoises decided to bow ride OUR boat. This is very rare due to the fact that our top speed is 6 knots while motoring. Todd said that it hadn’t happened to him in a few years. They hung around for a good 20 minutes before they found another boat that was near us. Basically when animals bow ride boats, they are literally surfing underwater. This was the first time I got to see a Dall’s up close, and it kind of looks like a little killer whale. We felt so lucky that we were getting all these amazing and rare experiences already! It seemed we had spent so much time with the whales already and had had so many awesome encounters, but as we were approaching them at East Point they were breaching all over the place. We thought we were going to be in for a good show, but when we finally reached them we got a different kind of show. 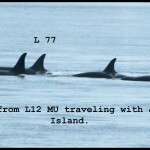 This was the first time we got to witness them resting in Boundary Pass. It was so cool how close they were to each other while rising for synchronized breaths. There had to be about 20 of them in tight group. They would sporadically do a few breaches or tail slaps here and there, but it was mostly a day watching them rest. 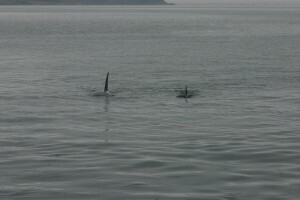 This was actually kind of creepy to watch because very slowly their dorsal fins would make their way out of the water. No whales on my birthday, they must have been busy or forgotten, but they sure made up for it when they came back the day after! We were heading for Discovery Island when we first saw them and when we actually got to them (and out of the way of a tanker) they gave me a great belated birthday show! We documented 19 spy hops in 2 minutes on Val’s camera, but there were definitely more. 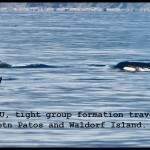 They were in a tight group as they usually are while resting, but they were active. Seeing so many spy hops all at once was spectacular. Not only did we got spy hops on top of sky hops, we had cartwheels, tail slaps and breaches as well! 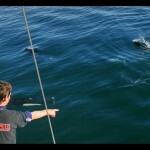 On this same day we were able to witness the Dall’s porpoise and Southern Residents interact! 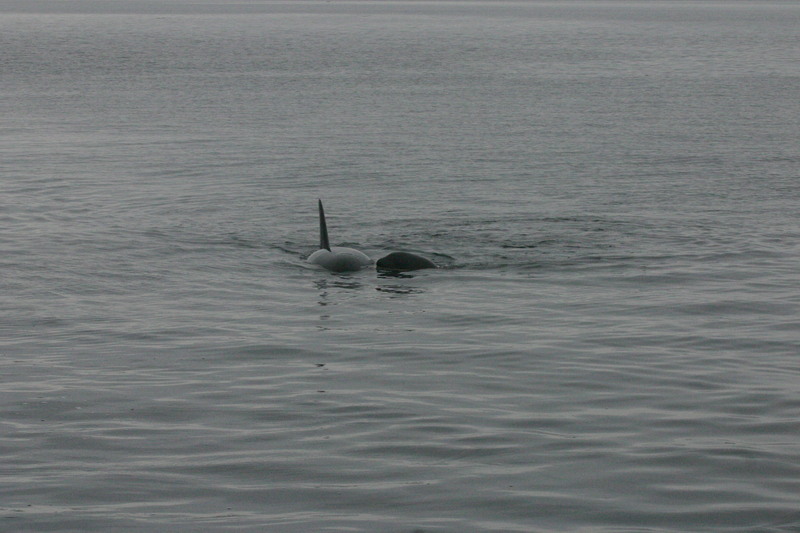 We couldn’t tell if they were enjoying each other’s company or if the Dall’s were annoying the Orcas. I like to think they had a mutual relationship and were just having a play date. It was amazing seeing two different species interact and “get along” in this crazy world. Living in Hawaii I get the pleasure of seeing Humpbacks every winter, but when we were in Canada for the acoustic conference and got word of “humpies” near race rocks, I was just as excited about being able to see them as I was the first time I ever saw one! (Maybe ever more excited) The day worked out perfect, we went into Victoria Harbor to clear Canadian customs, and raced back out to find them basically right there. I forgot how gigantic they were, and so graceful. 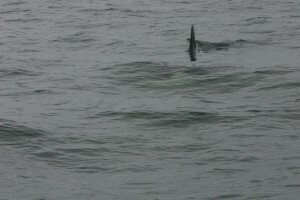 There was one moment where it was about 100 meters from our boat, and you could see its fins underwater. 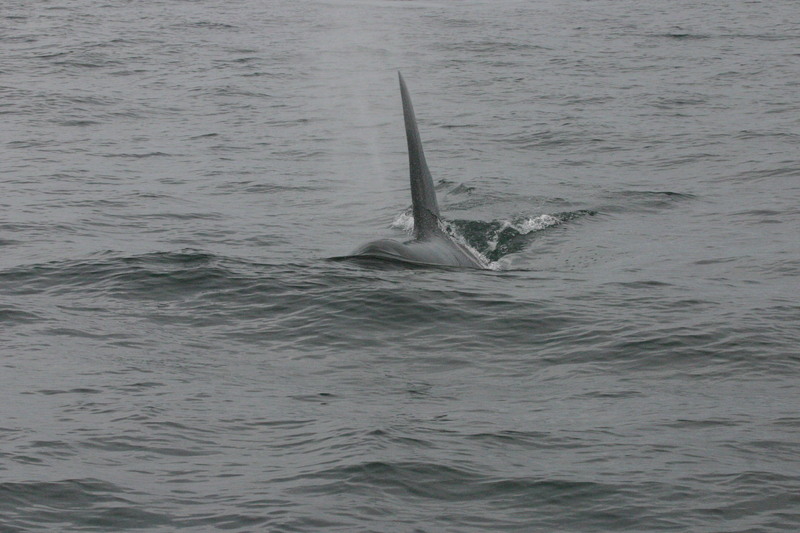 We thought it would come up again and we would be able to see the whole thing underwater, but he came up at our stern to meet up with another whale. 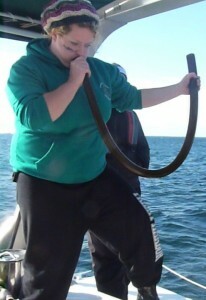 They went for a deep dive together and as they did that they showed us their flukes. It was breath taking. 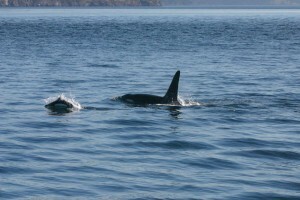 Transients- We have come across transients a couple of times. 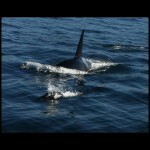 A couple times on the boat and a once from land, which was actually my first Orca encounter ever. We have tried to catch them while they are hunting, but we always seem to be a little late and see them right after they have eaten. 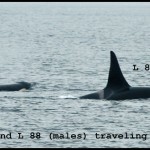 Our research focuses on Southern Residents so when we see transients it is purely for enjoyment. 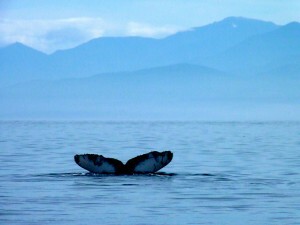 There are just a few more defining moments that I have come across while with the whales. One being able to identify them in the moment, I have gone through the ID books so many times that it must be paying off! Another fun moment was catching my first (and only) breach on video, and the next day getting a still photo of a breach!